Hey guys! Today we have another adidas amazing basketball shoe-The adidas Crazy Explosive Primeknit. In my opinion, 2016 was the best year for adidas, their released shoes were not else than a huge success not only for great performance, but also for fire designs. I’m very excited about this model because of that massive BOOST. So let’s see if adidas Crazy Explosive can really “explode”. 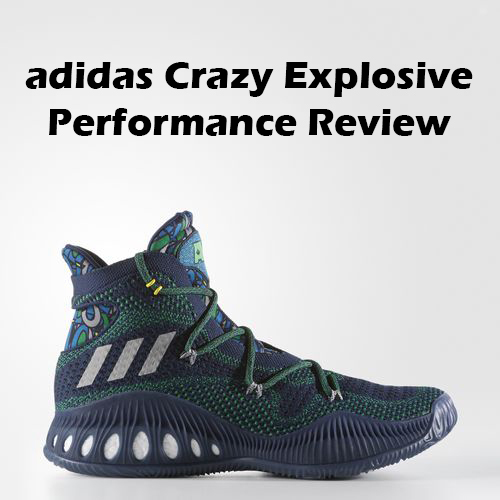 Welcome to my adidas Crazy Explosive Performance Review! The upper is covered with Primeknit. What’s so amazing about it? It features 100% pure Primeknit. Zero additional materials, just a little bit of hidden Nylon placed in high pressure areas for better stability. They’re so comfortable! Pure Primeknit offers great breathability and superb comfort. During the performance review, my feet felt amazingly comfortable. I can’t even explain how great the upper felt. AMAZING. It just wraps your feet like a sock, zero unrestricted areas, plenty of space for natural feet movement. The upper on adidas Crazy Explosive is very similar to the adidas Ultra Boost. So if you have a pair, you know what I’m talking about. We have a massive chunk of BOOST which offers stunning impact protection, A+ comfort, superb responsiveness and that explosive bounce to go with. Maybe somebody already told that, but Crazy Explosive I the most comfortable shoe I’ve ever played in. Soft TPU wraps around the midsole and adds excellent stability, so we have a full package. The TPU fully covers front midsole area for that great forefoot stability. Now the TPU in back area has some room for BOOST expansion. The adidas Crazy Explosive has multi-directional traction pattern. I have one words to describe it… KILLER. During the performance test I had no slippage problems: Amazing grip with court, great stopping power and solid move coverage. What else you want? Dusty courts? They got you covered. You can simple forget about whipping them. This is true indoor model, so I do not recommend playing with them outdoors. You will receive the same performance in outdoors but the rubber compound is too soft for long term usage. They fit true to size. For wide footers I recommend going true to size too since the upper is very stretchy and has plenty of room for extension. The unique lacing system wraps your feet nicely. This lace webbing is unique because it has only four eyelets. From the first sight I thought that this will be a down side for this model. However, the eyelets are strategically placed in main support sections and provide great lockdown. In addition, we have the massive padding inside the shoe for that lovely comfort feel. Impressive job adidas! They put TPU shank in midfoot area for torsional support and better stability. The new lacing system is very nice addition to overall lockdown. 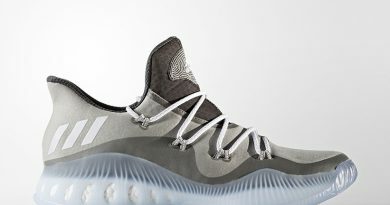 Of course the adidas Crazy Explosive is high-top shoe so you are getting great ankle support. Also there is enough space for ankle brace if you need extra protection. In result, I had zero heel slippage, lacing system wrapped around my feet nicely and the wide base provided with solid stability in every situation on court. Primeknit isn’t the most supportive material but with Nylon backing underneath it worked perfectly fine. The adidas Crazy Explosive has it all… You are getting the full package: killer traction, the best cushion tooling in the market, premium materials, lovely fit and solid support to go with. Everything you need to dominate on court, EVERYTHING. The Crazy Explosive will fit every type of player. Big guys or smaller guards it doesn’t matter, they all will enjoy playing in these. This is definitely the best 2016 basketball shoe, hands down… I’m in love with these bad boys. Now if you like low-top sneaker, don’t worry. 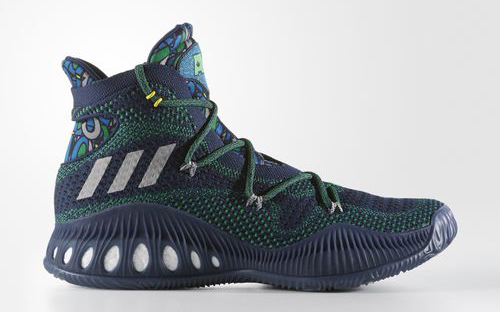 Adidas just released low-top version of the Crazy Explosive. Check them up here. 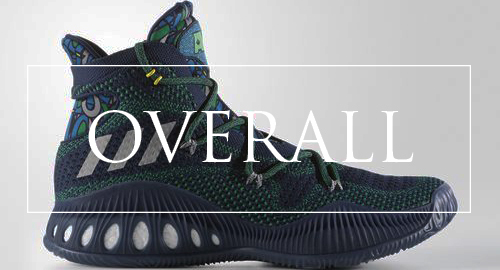 What do you guys think about the adidas Crazy Explosive Primeknit? Comment below! Going by your article, I can clearly see that these shoes are very high quality and worth the price. Sitting at $150 almost makes it a no-brainer, especially due to the great features it provides. I like the killer traction and the amount of cushion it offers. The adidas Crazy Explosive is sitting in my TOP3 due to amazing performance in every category. If you have any questions please do not hesitate to contact me at daumantas@basketballdiagnostics.com or leave a comment. I am considering buying a pair ever since they came out, but playing outdoors was a serious arguement against it, as the outsole looks like it’s going to disintegrate after only one session on an asphalt court. This year I subscribed to a local basketball club which gave me access to indoors practice. It’s not hardwood parquet, but plastic – which in any case is a lot better than playing outdoors. So maybe the time has come for me to get a pair. Only question is size. I have really wide but small feet, almost duck-like in shape. I wear size 42, 42.5-43 for Nike. Should I go true to size (42) or the next one up (42 2/3) in primeknit? To give you an idea, last year I bought a pair of D Lillard 2 Primeknit size 42.5, and my toes keep hitting the front of the shoe, even though the width is ok I think. Another pair of D Rose 6 synthetic leather (size: 42.5) took a lot of breaking in time, but towards the end they felt comfortable. I forgot to mention that I am 40 years old and I am looking for cushioning for my aching knees. I am also a bit overweight (1m71 in height and 87 kilos in weight) with a tendency to roll ankles if not careful. So stability, lock-down, wide-foot friendly and cushioning are my main concerns. There is no better time than now to finally pull the trigger and buy a pair. Hands down, the best indoor performer of 2016. And a perfect shoe for your age and build – ton of cushion, really wide base and solid lock-down with proper size. I would say go (42 2/3) since you have a really wide foot and they do run a bit narrow in the midfoot. Of course, the best idea would be to try them in store if there’s a chance. Hope this helped you.